With all the information contained on the Town of Brookfield website, here are some topics that will help you navigate to the information and answers that you are looking for. These links will take you outside of the Town of Brookfield website. This information is being provided to assist our residents. The Town of Brookfield does not endorse or take responsibility for content contained in these sites. Lately, I have been receiving phone calls from telemarketers that start with “Don’t Hang up! If you are in pain…”. Well, Don’t Hang Up! Because this is going to be painful, but please keep reading. First a little background. Back in the mid-eighties, the State passed a law that allowed local governments to charge a Room Tax on hotel room stays. The generated revenue is shared by the municipality and a local tourism entity. With municipalities using their share to help pay for the services provided to the hotels (Police, Fire, Paramedic, infrastructure, etc.) and the tourism entity using their share to promote the hotels as another way of attracting tourist to the Town and staying the night (‘heads in the beds’ as they like to say). This worked amazingly well for everyone! More people stayed in our hotels which enticed more hotels to come to the Town (we now have 5, soon to be 6) and, over the years, the Town’s share of the Room Tax grew to about 10% of our budget! Unfortunately, the Visitor Bureaus (they promote the Hotels) decided they wanted a larger share of the Room Tax. I, along with the Mayor of the City of Brookfield, went to Madison and successfully testified against changing the law when it came before the committee. However, the Visitor Bureaus would not be denied. They changed their tactics and in 2015 got the bill language inserted into the State Budget at one of those late-night meetings and, to our dismay, was passed! So what does this mean to you and the Town? The result of the new law is that by 2021, the amount of money that the Town can keep from Room Tax will be reduced to the amount that we collected in 2010, one of the worst Hotel Tax collection years due to the recession. This will reduce the Town’s Room Tax share to half of what we would have received in 2021 had the law not changed. In dollars and cents, this equates to a loss of revenue in excess of $1.3 million in just the first 5 years!! The loss of revenue in 2019 alone is estimated to be approximately $300,000. To make it worse, from 2021 and beyond, the Town’s share stays fixed at the 2010 level, or approximately $413,000 essentially forever, which means that the yearly loss of revenue will only get worse. Long ago the Town Board and the Department Heads focused on ‘needs’ and not ‘wants’ and submitted budgets to you, the residents and taxpayers, that are pretty lean. This is evident by the fact that, over the past decade, the Town has average an annual budget increase of just over 1%! The Town hasn’t borrowed any money since 2001, has no debt (except for a lease or two), saves for future purchases (bought an $800,000 fire truck in cash! ), and works on providing services (Police, Fire, Highway, etc.) at the highest level possible at a reasonable cost. However, we are facing a hole in the 2019 budget because of the loss of room tax revenue. The bad part is that the Towns levy will need to go up again in 2019 by 2.4%, or approximately $94,000 to cover the deficit. It should be noted however, that the Board is only increasing the levy enough to cover what we need and that the planned increase to the levy will only cover roughly one-third of the 2019 loss of room tax revenue. Again, the Town prides itself on keeping a tight budget! The really bad part is that we will likely see similar increases to future budgets until 2021 when our room tax revenue finally levels off. The Annual Town Budget Town Meeting will be on Tuesday, November 13 (at least it’s not a Friday) at 7 pm at the Town Hall. I will bring cookies so we can munch on them as we review the budget. Look forward to you all there. When you receive your License Plate Renewal Notice, take a close look at the Vehicle kept in line. 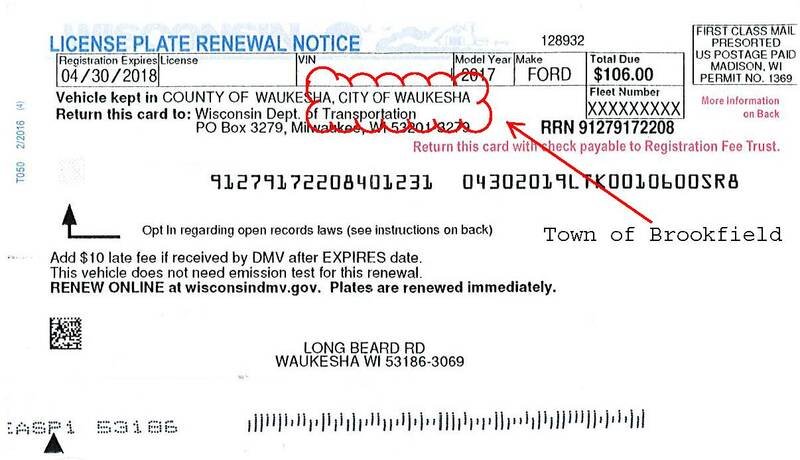 It is very important that it says: COUNTY OF WAUKESHA, TOWN OF BROOKFIELD. The Waukesha Freeman is the official newspaper for legal postings of the Town of Brookfield. Need a ride to a club or activity, doctor appointment, or just to go shopping? Call the Elmbrook Senior Tax (EST)i. The Taxi is available Monday through Friday from 8:30 am to 5:00 pm and Saturday, 9:00 am - 2:00 pm. Serving the Town and City of Brookfield, Elm Grove, and Butler residents only. $10.50 one way or $5.00 with EST card; $11.50 out-of-area or $6.00 with EST card. Also, Senior Meals are available at the Senior Center at 2000 N. Calhoun Rd. for $10.50 or just $1.00 per person with authorization from ADRC. Call 262-785-1200 one day (24 hours) in advance to make your reservations.